The table is set. The pieces are in place. Now it is time for some science. The attitude of this island centers solely on the pursuit of science, and the full-time staff have that pursuit at the center of their mission. Bonnie and Ed, the field station's managers, are indispensable in aiding the work of the two teams currently on island. Although they come from different backgrounds, each has a wealth of experience and a worldly sense. Their sage council, experience and genuine passion for both the island and the work conducted here is evident in everything they do. I both respect and like each of them immensely. Nadine is the island's resident chef for the first week of our stay. She is a woman of few words, and has proven to be somewhat enigmatic. What I do know so far is that her smile is broad and genuine and her food is exquisite. It is truly a treat for us to have such fine, fresh food while trying to get a large volume of work completed. The main building of the field station is the heart of Carrie Bow. The facilities at Carrie Bow are somewhat rustic, but cater to conducting scientific experiments and collecting data. 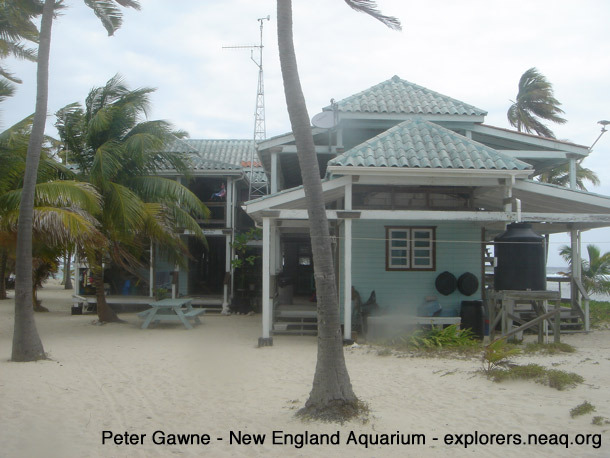 The centerpiece for Carrie Bow Cay is certainly the field station itself. While there are several outlying structures, the field station is without question the most dominant piece of architecture on the island. Complete with hammocks, benches and picnic tables, it is not without creature comforts. Unfortunately, time to enjoy the amenities of the island is in short supply. It would prove difficult to forget that the purpose of the field station is the pursuit of science. Before coming to Carrie Bow, I had a vague understanding that publications were at the center of academia. I did not realize the full extent of it. The field station's life-blood is scientific publications. The more publications that are generated from data collected at Carrie Bow, the better off the field station is. Generate a paper that is published in a prestigious journal and the field station is doing very well. Squander your time at the field station, return home with empty hands and your space at Carrie Bow will go to someone who will produce. Here it is truly the old scientific adage: Publish or Perish. A small squadron of ships stands ready to shuttle scientists to remote sites surrounding the island. Our morning commute into the field is mercifully short. After Randi and I prepare our dive equipment, nets, transects and miscellaneous gear, we hop onto a Panga powered by an 85hp outboard. These speedy little boats appear to be the standard in this part of the world. They are light and fast, and handle the sometimes-choppy ocean with ease. We are able to transport a great deal of equipment to a remote site and use the boat as a platform to conduct our experiments, gather data and manage the large assortment of gear associated with scuba diving. 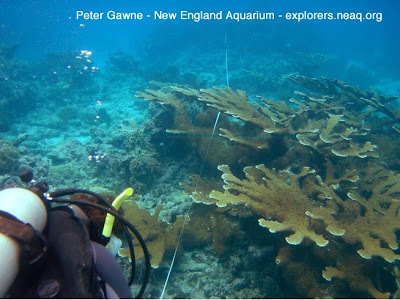 Dr. Randi Rotjan prepares a transect through a copse of Elkhorn coral (Acropora palmata). We don our tanks and get ready for the dive before us. Each dive is different, and many of the tasks are new to me. 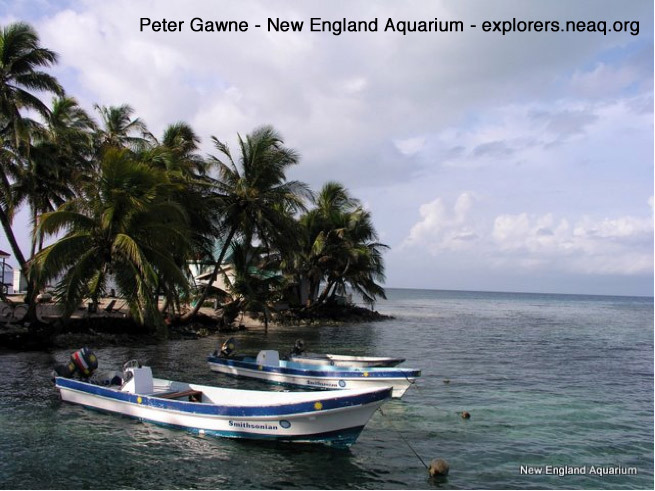 We are running transects, retrieving sensors, collecting live fish and conducting behavioral observations. It is a lot to keep straight, and all the while dozens of scientific names for various creatures are running amok through my head. I find this work challenging and it is important to me that I get this right. Fortunately, Randi has an agenda, is a patient teacher and possesses a fine mind for details. I am constantly trying to keep up, and hoping that my efforts are sufficient. It is late, and tonight we begin some nocturnal trials for an experiment that we have spent many nights preparing for. It is time for me to leave the computer and for us to get back in the field. #3 Time is a precious commodity.